Israel is the world’s largest importer of crude oil from the Iraqi province of Kurdistan in 2017, a report claims. 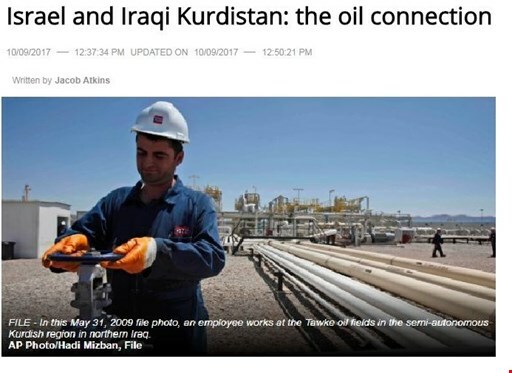 According to the data from the US company ClipperData which tracks and projects gasoline shipments worldwide, about half of all the crude oil which extracted from the oil fields in Iraqi Kurdistan, was shipped to Israel. Previously, Italy was the world’s largest importer of Kurdistan’s oil. It is estimated that the areas controlled by the Kurdistan Regional Government provide about 500,000 to 600,000 barrels of oil to the world market on a daily basis through an oil pipeline extending further to the port of Ceyhan in southern Turkey. During the time of the Kurdistan independece referendum provocations, the pipeline got shut down at least twice by Turkey. The Israeli media reported that the data disclosed by the members of the Gorran Movement, Kurdistan’s largest opposition party, indicated that Israeli companies received about 3.8 million barrels of crude oil from the Kurdistan region of Iraq in the month of September. The Israeli news channel i24News claims that although the buyers in Israel were mostly private oil companies, these purchases nevertheless injected substantial funds into the Kurdistan Province’s budget and gave real impetus to the statements, previously made by the Israeli Prime Minister Benjamin Netanyahu in which he fully supported the Iraqi Kurdistan independence referendum, and gave the “right to self-determination of the Kurdish people”, as he put it. Meanwhile, Iraq’s oil minister, Jabar Al Luaibi, has asked state-owned North Oil Co., the operator of the Kirkuk fields, the State Company for Oil Projects and the state pipeline company to begin the process of restoring and reopening the Kirkuk Ceyhan pipeline which extends all the way from the oil fields of Kirkuk province to the southern Turkish port of Ceyhan, and passed through the Iraqi provinces of Salah Ad Din and Nineveh. He urged to restore the former export capacity, which was between 250,000 to 400,000 barrels per day.